A guide to tell you what are the differences between fiber laser cutting machine and CO2 laser cutting machine, let you know what are the advantages of fiber laser cutting machine compared with CO2 laser cutting machine, so that you can make the right choice for your cutting works. Laser cutting is a thermal cutting process for processing metal. The laser beam is created by the laser source (resonator), conducted by a transport fiber or mirrors in the machine cutting head where a lens focuses it at very high power on a very small diameter. This focused laser beam meets the sheet metal and melts it. STYLECNC uses two types of laser sources: Fiber laser and CO2 laser. Laser cutting is extremely versatile. In addition to flat materials, tubes and profiles can also be processed by laser cutting systems. Primarily steel, stainless steel and alu-minum are cut. The thickness of the processed sheet metal ranges from 0.030 to 1.25 inch. Fiber lasers are the newest development in laser cutting. The laser beam is created by an active fiber and transmitted over a transport fiber to the machine cutting head. 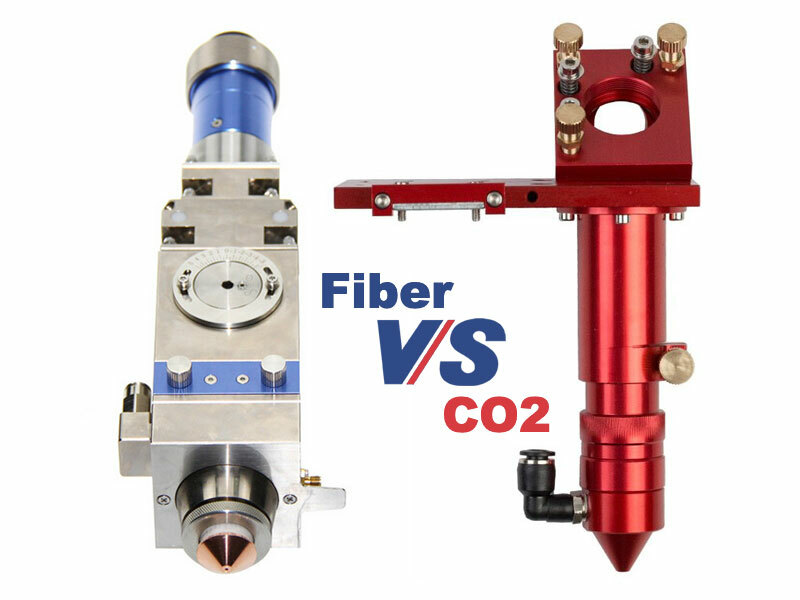 Fiber lasers are significantly smaller than CO2 lasers and generate twice as much power from the same amount of current. A fiber laser cutting system is primarily suited for processing thin to medium-thick sheet metal. It also cuts non-ferrous metals (copper and brass). A CO2 laser uses a gas mixture to create the laser beam. The necessary high voltage in the resonator is created with the help of wear-free semiconductor excitation modules. STYLECNC relies on such modules since they are smaller, more efficient and reliable than traditional solutions. The CO2 technology is suited for all-rounders who process various materials and thick sheet metal. The laser beam is focused by the lens in the cutting head and directed onto the workpiece by a nozzle. The cutting gas also flows through this nozzle. Depending on the application, oxy-gen, nitrogen or compressed air are used as the cutting gas. 1. Excellent beam quality: focus light spot is smaller, cutting line is more precise, the work efficiency is higher, the processing quality is better. 2. Extremely high cutting speed: 2 times of the same power CO2 Laser cutting machine. 3. High stability: the use of the world's top imported fiber laser, stable performance, the key components of the service life of up to 100 thousand hours. 4. High electro-optical conversion efficiency: fiber laser cutting machine photoelectric conversion efficiency of about 30%, CO2 laser cutting machine is three times higher, energy saving and environmental protection. 5. Extremely low cost of use: the power consumption of the whole machine is only 20-30% of the same kind of CO2 laser cutting machine. 6. Extremely low maintenance cost: no laser working gas, optical fiber transmission, no reflection lens, can save a lot of maintenance costs. 7. The product operation and maintenance is convenient: the optical fiber transmission, no need to adjust the light path. 8. Super flexible light guide effect: small size, compact structure, easy to flexible processing requirements. Of course, compared with the CO2 laser cutting machine, the cutting range of the fiber laser is relatively narrow. Because of the wavelength of the reason, it can only cut metal materials, non metal is not easy to be absorbed, thereby affecting the cutting range. License: The text of "Fiber laser cutting machine VS CO2 laser cutting machine" by STYLECNC is licensed under a Creative Commons Attribution 4.0 International License.